During winter, one ought to maintain a careful balance between keeping everyone at home warm and cozy, alongside making sure that the electric bill at the end of the month does not throw your monthly budget out of whack. Having said that, it is pretty nice to indulge once in a while, and for some of us, we tend to cozy up to our favorite couch with a nice, thick fleece blanket covering us to keep us nice and warm underneath. That is fine and dandy if you want to sleep, but what happens when you still want to read a book and yet keep most of your body warm? Enter the $159.95 Heated Furniture Cover. This particular heated furniture cover will be able to offer an instant cozy place to sit during the cold winter months. 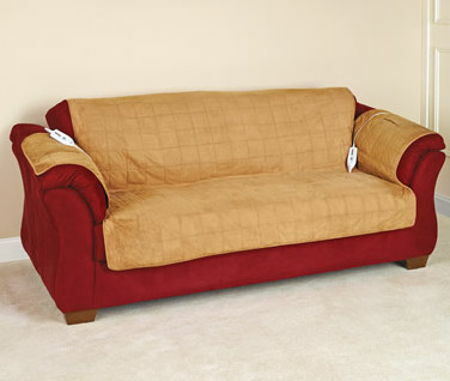 It is made out of soft microsuede, where the quilted cover will drape over the back, seat and arms of furniture, while sporting a textured backing to make sure that it remains in place. The cover itself will be able to produce an even, all-over warmth which will go a long way in reducing home heating costs simply by targeting heat directly at a room’s occupants. Not only that, thanks to its generous polyester filling within, the embedded heating elements are virtually undetectable for a comfortable lounging experience. There is a tethered controller that lets you play around with the temperature settings; while an auto shut-off feature will turn off heat after four hours.